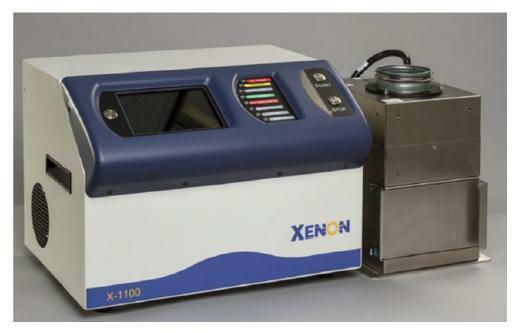 X-1100 is an advanced, laboratory R&D system - a highly integrated, flexible, highintensity Pulsed Light system that scientists, engineers and researchers use to experiment and define processes to address new applications with optimized solutions. 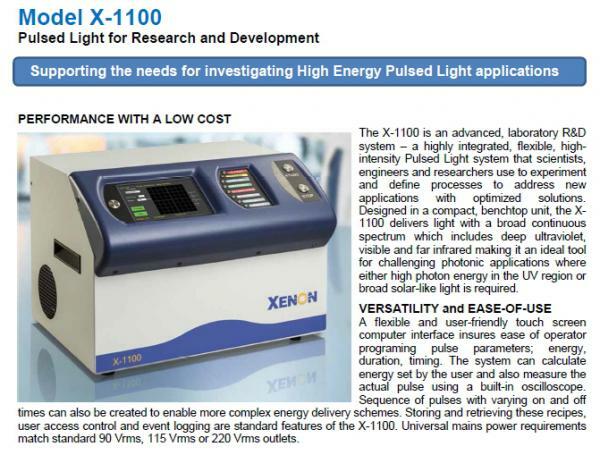 Designed in a compact, benchtop unit, the X-1100 delivers light with a broad continuous spectrum which includes deep ultraviolet, visible and far infrared making it an ideal tool for challenging photonic applications where either high photon energy in the UV region or broad solar-like light is required. VERSATILITY and EASE-OF-USE A flexible and user-friendly touch screen computer interface insures ease of operator programing pulse parameters; energy, duration, timing. The system can calculate energy set by the user and also measure the actual pulse using a built-in oscilloscope. Sequence of pulses with varying on and off times can also be created to enable more complex energy delivery schemes. Storing and retrieving these recipes, user access control and event logging are standard features of the X-1100. Universal mains power requirements match standard 90 Vrms, 115 Vrms or 220 Vrms outlets.